The Norse gods are pleased with your gaming abilities and they have invited you to this slot, where massive cash jackpots abound. Click here to play! Thor, the thunder god will reward you if you spin up the right combinations. 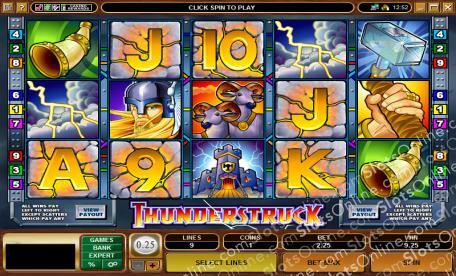 Thunderstruck is an electrifying 5-reel slot that is played across 9 pay lines. Whenever you win on an activated pay line, you will be given the opportunity to gamble. If you take up the challenge you will have to correctly select either the color or suit of a face down card. The Rams are Scattered and will not only payout up to 500 times your bet, but will also give you 15 free spins when three or more appear. Thor is Wild and will double your winnings when he is substituted into a winning combination. If you mange to earn 5 of him in one spin you will be rewared with 10,000 times your original wager! Thunderstruck is waiting for you to create a cash payout storm, or play the High Limit version of Thunderstruck to win even more epic proportions! The Rams are Scattered and will earn you up to 500 times your initial pay out. If you get 3 or more you will win 15 free spins, as well! Thor is Wild and can be substituted for any other symbol on the reels except Scatters. When used in a winning combo, Thor will double your winnings.